I posted back in April that I had my Netflix account put on hold until I decided if I wanted to continue paying for the service. By putting the account on hold, I was still able to continue to have access to the website and my movie queue. I was also able to continue to find new movies but I would not be charged the monthly fee. I've since decided that I will go ahead and cancel the Netflix account and sign up for Blockbuster Online. I don't go to the movie theater for numerous reasons; mainly, I like to be able to stop the movie when I want and replay a scene if I want to see it again. There are alot of movies out now that I want to watch and it is not cost effective to rent them one-by-one from the video store. 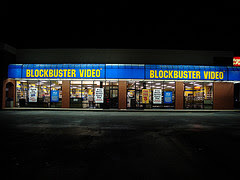 Blockbuster Online turned out to be the best choice for me since they offer the option of returning the movies to a store and renting additional movies on the spot for no additional charge. I have a Blockbuster store about two miles from my house so this option works out great. Right now, they are offering 50% off of your first month if you sign up through this link. I signed up this past weekend so my first set of movies should be arriving today. Hopefully, when I get home tonight, I'll have a couple of movies to watch. For anyone considering getting rid of cable or satellite, this may just be an excellent alternative for your entertainment. Have you found that Blockbuster offers the same number of titles as Netflix? I have not signed up for either yet (doing my research first).